The Anaheim Ducks began last season in London as defending Stanley Cup champions. They start this season 6,000 miles further west, hoping to bring the Cup back to Southern California after a disappointing season that ended with a first-round loss to Dallas in the Stanley Cup Playoffs. The Ducks struggled all season to put the puck in the net. The absence of Scott Niedermayer and Teemu Selanne for most of the season didn't help -- nor did a late-season injury that cost Corey Perry the last 12 games of the regular season and three of the Ducks' six playoff games. Niedermayer will be on board for the whole season. Selanne's status is still up in the air, but unlike last season, when the Ducks gave both players virtual carte blanche to set their own timetables for deciding whether they wanted to play again, the team has told Selanne he has to make a decision before training camp. The Ducks also learned one of the toughest lessons in sports: It's one thing to win a championship; it's a lot tougher to repeat. "The year after you win it, I never realized how tough it was," Senior Vice President of Hockey Operations Bob Murray said. "Last year was a long, tough year and nothing we did turned out right. We didn't get enough kids in, but this year, the kids are going to have every opportunity to knock some people off." The kid who figures to get the biggest chance -- and on whom the most is riding -- is Bobby Ryan, the No. 2 pick behind Sidney Crosby in 2005. The Ducks made room for him by buying out Todd Bertuzzi after Ryan had a strong playoff with Portland in the American Hockey League. Last year's scoring problems wasted a superb season by starting goaltender Jean-Sebastien Giguere and backup Jonas Hiller. The Ducks' 2.24 goals-against average was second in the NHL, behind only the 2.18 mark put up by the Stanley Cup champion Detroit Red Wings. They also surrendered a League-low 100 goals at even strength. But Anaheim averaged only 2.40 goals per game, 28th among 30 teams and the worst among the 16 playoff teams. The Ducks have to generate more scoring -- and play with more discipline -- to take advantage of one of the best defense-goaltending combos in the NHL. Giguere had a 35-17-6 regular-season record, and his 2.12 GAA and .922 save percentage were among the NHL's best. He bailed out his low-scoring and often undisciplined teammates on numerous nights, but was unable to do it during the postseason, when the Ducks paid a big price for their inability to stay out of the penalty box. Giguere has already shown he has what it takes to win a championship -- he won the Conn Smythe in 2003 and led the Ducks to the Cup four years later, then re-signed as a free agent last summer. Expect him to carry the bulk of the load once again. But should something happen, the Ducks are well-protected. 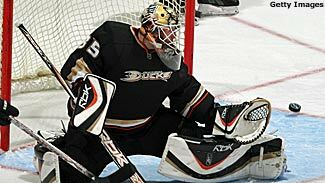 Hiller earned a new, two-year contract from the Ducks after an excellent rookie NHL season in which he went 10-7-1 with a 2.06 GAA and a .927 save percentage. The 26-year-old Swiss native's presence also means the Ducks don't have to do what several other teams were forced to do last season -- burn out their starting goaltender by playing him in 65-75 games. The Ducks' first line of Ryan Getzlaf (24-58-82, plus-32) between Perry (29-25-54 in 70 games) and Chris Kunitz (21-29-50) was often the only one able to generate offense last season. After losing Dustin Penner as a restricted free agent in the summer of 2007, General Manager Brian Burke made sure Getzlaf and Perry would be Ducks for the long term by signing each to five-year deals worth more than $26 million. The three were the only players on the club to break the 20-goal mark last season. Ryan could supplant Kunitz, a jack-of-all-trades type of forward, on what has the potential to be one of the NHL's most dynamic young lines. They've waited three years for him to be ready for full-time NHL employment and are banking on him to step into a top-six spot. At 6-foot-1 and 221 pounds, Ryan has the build of a top-flight power forward. Murray feels he has the skills to match. "For a big boy, he's got great hands. He'll score goals," Murray said. "He's still a little gangly, but power forwards can take some time. He still hasn't grown into his body. He's taken a little more time, but guys like that often do. Bobby is huge to our future." Having Selanne for a whole season would help, too -- but at least Ducks will know before the season what he'll be doing. The Ducks are also counting heavily on free-agent signee Brendan Morrison to center an effective second line. Morrison's production has been declining in recent years, but injuries have been a factor. Morrison may miss the start of the season recovering from surgery, but the hope is that will be the last problem for him. The checking line of Samuel Pahlsson between Travis Moen and Rob Niedermayer is among the best in the NHL. They're fast, physical and can contribute the occasional goal. One major key is Pahlsson's health -- he missed 26 games last season with an abdominal injury. All of Anaheim's forwards are physical -- the Ducks are among the biggest bangers in the NHL. One key will be their ability to stay out of the penalty box; Anaheim was the only team in the NHL to allow more than 400 power-play attempts -- one reason the Ducks struggled so badly to score was that they spent so much time killing penalties. It's one thing to be physical, but quite another to put your team down a man. Some of the Ducks' more aggressive players have to figure out the difference. Having Scott Niedermayer on the back line for the full season should make a huge difference for the Ducks. Though Niedermayer turned 35 this summer, he's still among the best skaters in the NHL and his return midway through last season coincided with the Ducks' surge into the top four in the Western Conference. "When I first started thinking about retiring last year after we won the Stanley Cup, I maybe didn't appreciate some of the things that would make it difficult to walk away from the game, some of the things that I've enjoyed for a long time playing this great sport," he said after deciding to play this season. "(It's) something I've enjoyed doing since I was 6-years-old. I have a little different perspective on it. I think physically and mentally, I definitely feel a lot fresher right now than I did a year ago at this time. I think that's a big change as well." The combination of Niedermayer and Chris Pronger is as good as it gets. Pronger (12-31-43 in 72 games) has a rare combination of size, strength and skill. He also brings a big shot to the power play. The Ducks need Niedermayer and Pronger to play up to the level of 2006-07, when they were arguably the best tandem in the NHL. They also need improvement from Francois Beauchemin, whose play tailed off last season after an excellent showing in '06-07. Kent Huskins has improved over the past couple of seasons and could earn more playing time, and the Ducks added veteran Steve Montador for size and depth. With the Ducks snuggled tightly against the salary cap, Mathieu Schneider could wind up being traded to create room. That would open time for Huskins as well as for youngsters Brendan Mikkelson and Brian Salcido. Mikkelson is a smooth-skating defensive defenseman, while Murray calls Salcido "a home-run hitter, an offensive guy. He's high-risk, high-reward." * With Scott Niedermayer on board for a full season, the Ducks have one of the NHL's deepest, most versatile defense units. Few teams get as much offensive production from the blue line as the Ducks, and when combined with a top-notch goaltending duo, it's tough to score on Anaheim. * Everyone will be "all-in" -- Burke let Niedermayer and Selanne take their time last summer and fall deciding whether they wanted to come back. That won't be the case this time. * Having seen the Red Wings take away the Stanley Cup, the Ducks will face less pressure and have more hunger to bring the Cup back to the Honda Center. The diminished pressure will give them the chance to work in players like Ryan up front and Mikkelson and Salcido on the back line.